An ex-Wall Street trader improved on Moneyball’s famed sabermetrics to place bets that would beat the Vegas odds on Major League Baseball games – with a 41 percent return in his first year. Trading Bases explains how he did it. After the fall of Lehman Brothers, Joe Peta was out of a job. He found a new one but lost that, too, when an ambulance mowed him down. In search of a way to cheer himself up while he recuperated in a wheelchair, Peta started watching baseball again, as he had growing up. That’s when inspiration hit: Why not apply his outstanding risk-analysis skills to improve on sabermetrics, the method made famous by Moneyball – and beat the only market in town, the Vegas betting line? Why not treat MLB like the S&P 500? In Trading Bases, Peta shows how to subtract luck – in particular “cluster luck”, as he puts it – from a team’s statistics to best predict how it will perform in the next game and over the whole season. His baseball “hedge fund” returned an astounding 41 percent in 2011 – and has never been down more than 5 percent. 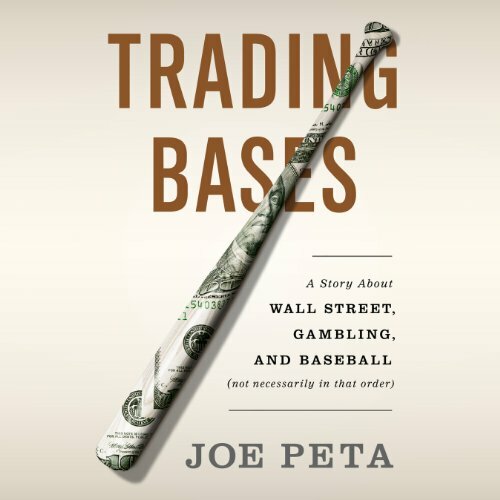 Peta takes listeners to the ballpark in San Francisco, trading floors and baseball bars in New York, and sports books in Vegas, all while tracing the progress of his wagers. Often humorous, occasionally touching, and with a wink toward the sheer implausibility of the whole project, Trading Bases is all about the love of critical reasoning, trading cultures, risk management, and baseball. And not necessarily in that order.